Accra, June 7, GNA - President John Agyekum Kufuor, would leave Accra on Monday to attend the G-8 Summit in Georgia, USA on June 10. A statement from the Foreign Ministry said the heads of State of Algeria, Nigeria, Senegal, Uganda and South Africa would also attend the Summit. It said the invited African countries were leaders on key American and G-8 initiatives focused on achieving result in New partnership for African Development (NEPAD), Private Sector-led growth and poverty alleviation, peace, security, HIV/AIDS, malaria and polio eradication. President Kufuor is expected to lead discussions on peacekeeping with specific reference to Liberia and Economic Community of West African States (ECOWAS) issues; the concept of an African Standby Force and the operation of African Peer Review Mechanism. Accompanying the President would be Nana Addo Dankwa Akufo-Addo, Foreign Minister, Ambassador D.K. Osei, and Mr Kwabena Agyapong, Press secretary to the President. Ghana's Foreign Minister would attend a meeting on substantive multilateral issues to be held between Dr Condolezza Rice, US National Security Adviser and African Foreign Ministers. 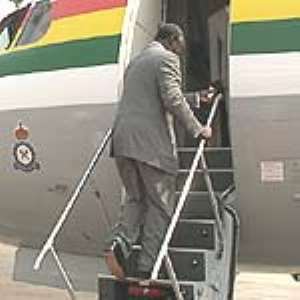 The delegation would return to Accra on June 13.